A vocal advocate for breaking down the misconceptions and stigmas as well as advocating for the abilities of people who are blind and partially sighted. Ashley Nemeth is a CNIB spokesperson, motivational speaker, writer, blogger, as well as, AMI and visionware.org contributor. Ashley was born with albinism which left her legally blind, seeing colours and outlines of images but no fine detail. Three years ago, she lost the remainder of her sight and is now totally blind and only perceives small amounts of light. Over the years, Ashley mastered independent travel or white cane skills which enabled her to qualify for her guide dog. On September 14, 2014, Ashley graduated from Guide Dogs for the Blind with her first guide dog, Rick. Ashley is the mother of three and resides in Indian Head, Saskatchewan with her husband, Rob. Ashley speaks and writes about accessibility, inclusion, guide dogs, her employment struggles, bullying, parenting, myths about blindness and overcoming the perception of the limitations of people who are blind and partially sighted. 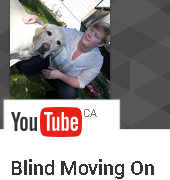 Her blog, blindmovingon.com educates the public and gives an honest look into her world. Her lack of sight doesn’t limit her as she embraces life to the fullest. She enjoys cooking and baking with her three children, snowboarding, golfing, and one day will find a way to drive.